We recently caught up with Corinne P. to learn more about her customer service philosophy and how she creates positive customer interactions. Corinne is a Rental Agent at Moncton International Airport in New Brunswick, Canada. 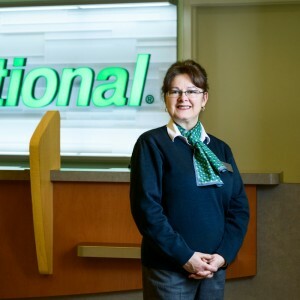 A customer wrote an email to National to express his appreciation for Corinne, who went above and beyond the call of duty during a recent rental experience. Q: Tell me a little bit about this particular customer. A: A customer called one afternoon after the vehicle he and his wife rented began experiencing mechanical problems. The pair had been visiting Prince Edward Island when the car suddenly became difficult to drive. They pulled off the road and called to see what they should do. From the tone of their voice, I could tell they were a bit frantic. Mechanical issues can create a stressful situation so I knew I needed to find a solution as fast as possible. Q: How did you help the customer? A: After troubleshooting what may have gone wrong and not finding an easy answer, I picked up the phone to look for another car. I called every Enterprise and National location on the island to see if I could find something to accommodate them. In the end, we found a car for them at Charlottetown Airport. Q: What made you go above and beyond? A: I put myself in the customers’ shoes and knew what I had to do. Since it was high vacation season, I knew finding another vehicle would be a challenge. They needed help, though, and I was their only lifeline. This is the type of service our company is known for so every day I challenge myself to take my customer service to the next level. Q: What advice can you give others about providing exceptional customer service? A: Put yourself in your customers’ shoes, and you’ll know exactly how to treat them well. In doing so, it’s just as important to stay in contact with them if a situation arises – over-communication can make a stressful situation more manageable. I made sure to keep my customers in the loop as I looked for a replacement vehicle so they knew someone was working to find a solution. Because of that, they were really patient with the situation. Q: Tell us about your career path at National? A: I’ve been a Customer Service Representative for National for nearly 10 years. I’m really a people person, and I think that’s part of the reason why I love my job so much.